You can copy your digital photo files onto a DVD by using your computer’s DVD burner (this figure shows an external DVD burner). 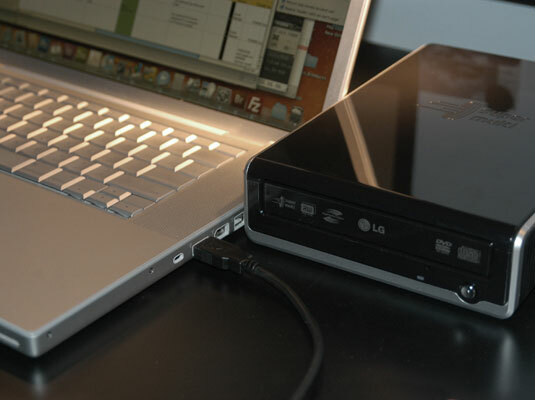 A DVD can store more digital images than a CD, and DVD burners have largely replaced CD-only burners in most computers. DVDs: The prerecorded kind of DVDs come with stuff already written to them. You can view what’s on them, but you can’t erase the stuff from and then rewrite to them. DVD+R and DVD–R discs: Can be written to only once. The plus/minus varieties are separate formats, but most drives and burners can read both types. The –R version can be slightly more compatible with some television DVD players. DVD+RW and DVD–RW discs: Can be written to, erased, and written to again. DVD Dual Layer discs: Require a dual-layer compatible drive or player. What kind of DVD you copy your digital photos to depends on the equipment you have and what you want to use that DVD for.